If you want to use it with your PC or Mac, grab this adapter. Klipsch Image ONE Bluetooth Headphones ($100) | woot! 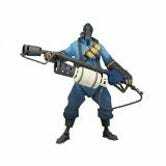 NECA Team Fortress 2 The Pyro Action Figure, 7"